Medieval psalters were made to be used either for personal devotion or in church services, including the offices or daily cycle of prayers recited by monks. The Glenorchy Psalter was used in a monastery in Argyll, in Scotland, before the Reformation, but by the first quarter of the 16th century it was owned by the 3rd earl of Glenorchy, Colin Campbell. Its calendar, an aid to the manuscript's users in planning prayers and readings for services, lists many saints who were revered in western Scotland. The psalter opens with its calendar. The month of January is set out according to the Roman system of kalends, nones and ides. 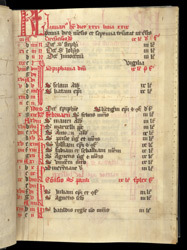 Important feast days are written in red ('red-letter days'), including the Feast of the Circumcision and Epiphany. Names of saints are given for each day to indicate when they were commemorated.